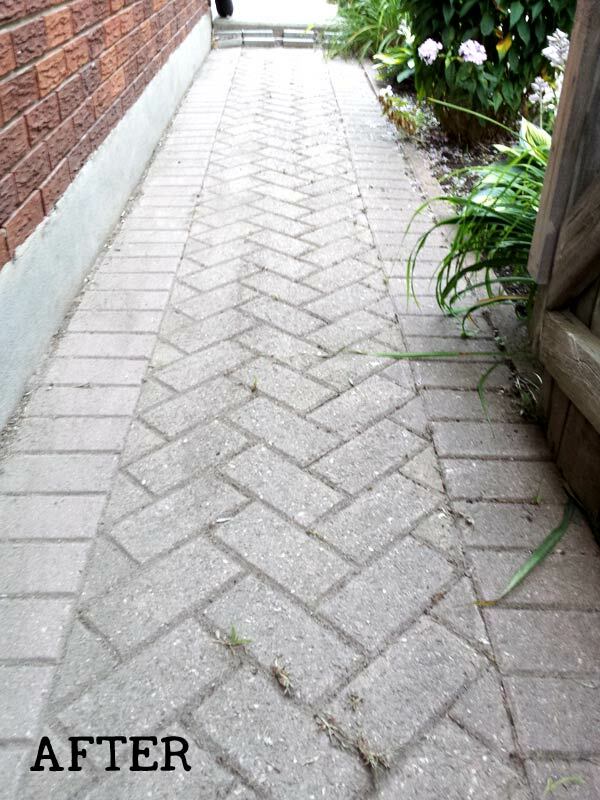 If you have a brick pathway, driveway, or patio, you know the curse. For as nice as they can look, all of those zillions of tiny spaces between the bricks are actually weed breeding centers. And only the most aggressive need apply! Not only does it look terrible, but it can be a long and aggravating process to remove them. And it’s rarely a one-shot deal. 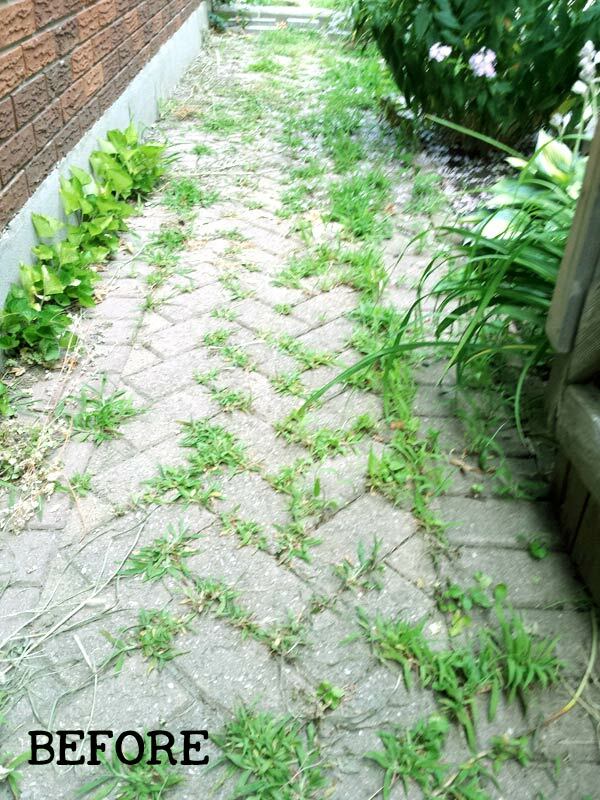 Let’s look at all of the options available and see if there are any easier shortcuts for removing weeds from brick walkways. Once that’s done, there is a preventative solution going forward. Related: Ideas for stepping stones and garden pathways. Have you ever heard the (sarcastic) saying the gift that keeps on taking? That’s what a brick pathway / driveway / walkway is. Oh, they can look really nice. In fact, our last home was originally the model home for a new development, and, to show the upgrades possible, instead of installing a plain asphalt driveway, they splurged the big bucks to create an elaborate brick design to give the front of the home more curb appeal. And it looked really nice. And we liked it just fine. Until we were initiated into the curse of the brick driveway. And what are the odds are next home would also have the same design? Oy. The weeds start appearing in the cracks between the bricks. And, unlike most weeds in the garden, you can’t just stick a weeding fork under them and pry them out. These guys have deep roots, firmly in place, well below the immovable bricks. You can try pulling the tops, but, more often than not, just the tops pull off, leaving the roots to make a mockery of our efforts by doubling in size and taunting us soon after with even more growth. Before you read any further, keep in mind that I am an organic gardener. By this I mean, I do not ever intentionally introduce anything into the soil or water on our property that negatively affects the soil, water, or environment. For me personally, I do not think you can ever justify harmful actions for the sake of cosmetic problems in a garden. I also do not sweat the small stuff. There is no such thing as the perfect growing year. Some years some plants thrive, other years, others thrive. Pests come and pests go. In most cases, I just leave things to sort themselves out or, at most, hand pick pests, and look at ways I can diversify the plants further to achieve a greater self-correcting balance between the things that live here. So, when it comes to weeds in the driveway, my choices are always going to abide by the mandate to never create a new problem in the process of remedying an existing one. Especially when the new problem could be something I would have no ability to undo like removing toxic chemicals. Yes, it’s a driveway and pathway made of bricks and the cracks are filled with weeds and it looks awful, but the ongoing effects of using toxic poisons, whether they are (misnamed) natural or not, is not an option. And sometimes there are not easy solutions without paying a bigger price. First, let’s look at the most common suggestions found online. These get shared like candy and, as you’ll see, are mostly wives’ tales that can be harmful to the environment and waste money. Keep in mind that a weed is not really gone unless the roots have been entirely removed. 1 Not Recommended: Pour boiling water on the weeds. Result: Boiling water only kills the foliage (leaves), not the roots. But, a steam cleaning machine can kill them at the roots. See my experiment here. 2 Not Recommended: Pour vinegar on the weeds. There are various strengths of vinegar. Our common household vinegar is 5% acid, pickling vinegar is 7%, and industrial, sometimes also called Horticultural vinegar is 20%. The two lower concentrations may kill leaves, not roots. The industrial strength is a horrifically dangerous acid and completely inappropriate for any home applications. Sorry vinegar, you’re not for the garden. 3 Not Recommended: Pour table salt (sodium chloride) on the weeds. Yes, salt can kill anything it comes into contact with in the garden, but it also negatively affects the soil and water and never dissipates. In other words, it’s a bad choice. Stop what you’re doing and go delete everything you have repinned on Pinterest that suggests using salt in the garden! 4 Not Recommended: Pour Epsom salts (Magnesium sulfate) onto the weeds. Different salt, same problem. It is irresponsible to use Epsom salts in your garden unless there is a specific, proven magnesium deficiency in the soil and you are amending it to repair the problem. Otherwise, the Epsom salts get in the soil and water and stay for eternity, creating a harmful imbalance. 5 Not Recommended: Pour neem oil on the weeds. I could not believe it when I saw this one. Perhaps conspiracy theories are the answer: those with something to gain by promoting a product make up these ridiculous ideas to get people buying them. No, neem oil is not going to kill weeds. Like any oily substance, it may suffocate or smother insects and microbes that come in contact with it, but other than that, the weeds will carry on and you don’t need oil in your soil or water. Oils of any kind are not appropriate for weeds. 6 Not Recommended: Pour baking soda and/or vinegar on the weeds. We’ve already established that vinegar will not kill the roots of plants, unless it’s industrial strength, which is totally inappropriate for home applications, and baking soda is not going to change this. On its own, a diluted solution of baking soda in water does have a valuable use in the garden if used sparingly and cautiously for hastening the spread of powdery mildew on plants. But alas, it does not kill weeds so forgetaboutit. 7 Not Recommended: Pour milk on the weeds. Sorry, no, not a weed killer! However, a mixture of milk (1-part) and water (2-parts) can be effective in combatting blackspot, and mildly effective for powdery mildew. 8 Not Recommended: Spray dish soap on the weeds. Dish soap is actually synthetic detergent. It breaks down oils and waxes on surfaces and, because of these properties, will kill or weaken plants—not just weeds—indescriminately so it is not recommended. If you read the ingredients in many dish soaps, you can see that these are not substances that should be introduced to our soil or water. I use a few drops of dish soap diluted in water to kill bugs like Japanese beetles (by dropping them into it). Even in small amounts, you don’t want this stuff poured on soil. This is more effective than anything else listed here because it actually kills plants at the roots, but, as you can probably guess, is still not appropriate for home garden use. Here’s a few notes from what I have read. I wanted to look beyond the politics and see what the research says. The active ingredient in Roundup is the same ingredient in many weed killers available on the market today: glyphosate. This is a non-selective (broad spectrum) systemic herbicide which means, unlike the other substances mentioned here, does actually kill plant roots, not just the foliage. If you want to read more, see https://en.wikipedia.org/wiki/Glyphosate. If you read the label on any product containing glyphosate, you will see that is (like many other garden products) indeed a toxic substance. 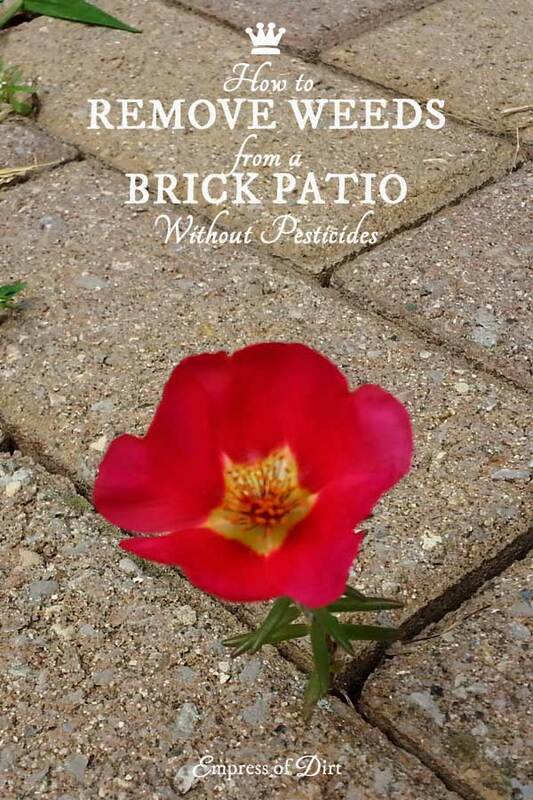 Given the risks and possible repercussions of using glyphosate, either due to improper handling or application, for situations like weeds in a brick driveway, it really has no place in the home garden. If there was a horrific invasion of something like poison ivy or other invasive that is going to take over and choke out natural habitat, that may be a suitable application. Again, we’re talking weeds on a driveway, not some other much greater problem with dire financial or health implications where the benefits would outweigh the risks. The goal is always to leave nature the same or better than we found it, so, beyond the politics, no roundup. So, what the heck can we do to get these weeds out of the driveway? The answer is hand picking or steaming. Steaming is the easiest and longest lasting. Otherwise, good, old-fashioned hard work is your best bet. Weeds in damp soil pull out easier than those in dry soil. If it hasn’t recently rained, pour water onto your work area, and let it soak in before you get started. Wear tight-fitting gloves with good grip. I know some people hate wearing garden gloves. Personally, I can’t stand the feeling of dirt pressing under my finger nails and I like the added strength a good glove provides for pinching weeds at the ground level and pulling them out, roots and all. Our driveway and walkway have narrow cracks and wider ones. I use my Fiskars billhook for the wider ones. I use the billhook for all of my regular garden weeding as well. Most weeds in the narrow cracks come out by hand. Otherwise a serrated kitchen knife does the trick. If you want to invest in this for the future, there are also various tools sold as ‘crack weeders’ or Dutch / hand hoes, that can reach in the narrow gaps and pull the roots out (if you’re lucky). A job like this cannot be rushed. I load up my phone with favorite podcasts and wear earbuds while I work. You might prefer a playlist of favorite songs. I have really sensitive knees and use knee pads all the time in the garden. It sure beats the feeling of kneeling on a stone. Yow! And, for a job that may take a few hours, you might as well be as comfortable as possible. Again, you can’t rush this job. Every weed that breaks off from the stem and does not get its roots uplifted will be another weed that greets you again next week. Work slowly and methodically. And bribe other meticulous workers to help you. Curse the guy who invented brick driveways. When our driveway is at weed maximus, a thoroughly weeding takes 3-4 hours. At least one hour of this time is spent thinking up ways to permanently seal the cracks so that I never have to do this again. If I’m smart, I then take 10 minutes per week to maintain the weedlessness. But, much like a clean house, it does seem to sneak away and stir up trouble when one is busy living life. The cracks either need to be sealed or filled with a polymeric jointing sand, which will slow the growth of new weeds. There are no shortcuts for weeding a driveway. To remove the weeds by hand, be sure the soil is damp, use the right tools, get comfortable knee pads and good tunes to listen to, be patient so you get the roots out, take breaks to place curses on the inventor of the brick driveway. Future problems could be slowed or prevented by sealing the cracks or filling them with polymeric jointing sand. And note to self, never buy another home with a brick driveway. 7 Weeding Tips Every Gardener Should Know | These make it much easier! By the way, my wonderful Kindle changed the word “weed” with “added” in my first post and I didn’t catch it. Well, I am in trouble. We bought a house that already has added problem…so much for prevention. I am 73 and have arthritis, so no bending over or kneeling on my unused garden pads. We are on a limited income, so I can’t afford to hire some young person to do the work and my 14 grandchildren live in other states…or countries. So I will continue to spray them with vinegar and give them the evil eye. Round-up is a dirty word in our house. Best product ever. 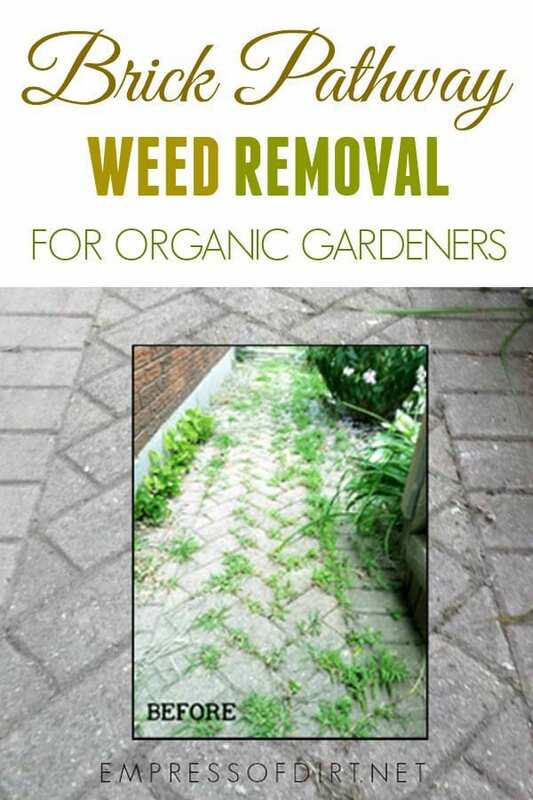 Burning your weeds is easy and safe on brick paths. I hear this suggestion a lot but, since my criteria here is to keep it organic, burning fuel to remove weeds doesn’t really fit! But thanks! I have read that “Cornmeal” kills Weeds. I just bought organic cornmeal but to be honest, I have not used it yet!! Has anyone had success with Cornmeal killing weeds, and does it ruin the ground? No, it doesn’t. It’s another gardening myth. We just had our cracked cement driveway replaced, along with our cracked patio in the backyard with pavers. The driveway had a large cloth and then ground stone and after pavers were placed in a pleasing pattern, the polymeric jointing sand was added. Now they are sealing the driveway and patio with a topping to keep the pavers looking clean and having the color shine out. I am happy with the process and hope to have minimal upkeep for the next three years or more. Great article to keep me aware of how to eliminate any “intruders that spring up among the pavers! It might be useful to note that anyone installing brick or hardscape would benefit from laying weed blocker landscape cloth underneath first. It does breakdown, but lasts a while and helps tremendously. Preventing the weeds is a huge topic! I see so many conflicting reports about weed blocking cloth as well as other ideas like sealants to close the cracks. 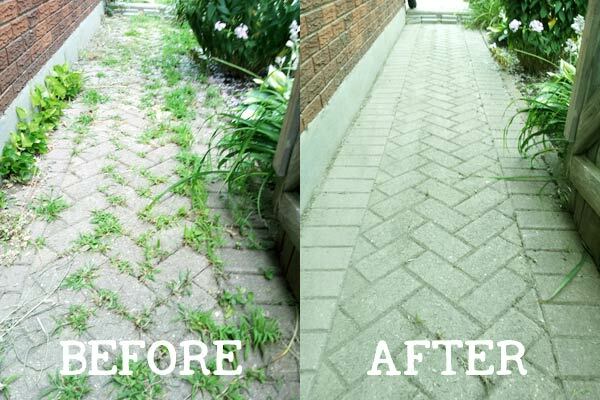 After thoroughly weeding, try sweeping polymeric sand into the cracks. It works! We, too, had a brick patio in our old house – and we installed it! It was the cheapest option, since we got all the bricks for free, but those first years I was cursing it for all the weeds. Thank you, Jami! I may try something similiar. Most of the cracks are so narrow (1/16″) that it’s nearly impossible to dig in and get the weed roots. I may have to spend a day filling the cracks. Nice article, Melissa. I’m a bit confused though about the application of baking soda to “hasten the spread of powdery mildew.” What is the reason to do this? bothered, as they are coming up, I planted all fruit bearing bushes for the birds, and I get a ton of Waxwings come winter time eating them.. Thank you, for all your help and advice………..
You might consider torching them with a propane or butane burner/flamer. It’s fast, effective and chemical free. No knee pads required. I can’t imagine a torch flame is not going to reach the weed roots hidden deep under the bricks. It will just burn what it comes in contact with. Yep – totally agree that pulling is the only way to really handle the job. 14 years ago we had a paver patio installed, and we pulled the weeds fairly regularly. We’ve since moved away from that house, and now have a brick sidewalk in two areas of our yard. The installation used a new polymer sand that actually adheres to itself and to the pavers as it dries, so weeds have a much harder time getting in the cracks – win! Hi Jenny, I’m familiar with the polymer sand but cannot imagine trying to force it into cracks that are just 1/16″ or narrower, and to actually get enough in to stop any weed roots below. Have you tried it? Is it as impossible as it sounds? Would be good on a new installation though. I have always loved the look of brick (stone, etc etc), but yes-the maintenance is a nightmare. I was so glad when STAMPED concrete came around. Same glorious looks—NONE of the hassles. And yep–pulling those suckers is the only guaranteed way to get rid of weeds. And after it’s cleaned up, you have that morning cup of coffee out in the driveway and pluck the few that come up at a time. Hi Susan, I see stamped concrete in our area and it seems to be hit and miss whether, over the long term, that joined areas that have been sealed actually hold up. Is it better where you are? There are some older ones that have weeds coming through. Could be because they were done before current, better materials appeared on the market though. Can’t say I’m a fan of the cost of replacing brick and getting anything new installed. Such a cunundrum.